Round 41 at anime20in20 was extra fun for me because I got to make icons for the most beautiful movie that isn't from Studio Ghibli... Hotarubi no Mori e. I think anybody who's unfamiliar with this should go find it now and watch it. I'll be here for you when you're done. Anyway, Round 41 had an amazing turnout, and I'm pretty shocked I won anything since all the icons for each theme were so inspired. GO TO anime20in20 NOW AND SEE. And now for the shiny banners! 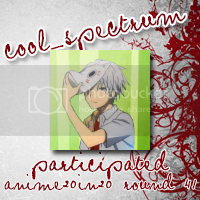 Thank you to just_miya for providing the participation banners this round! Many thanks to mmrobitussin for these beauties!